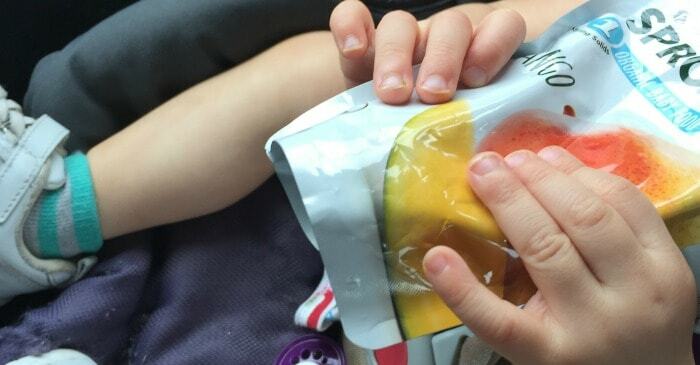 What am I really feeding my kid on the go?! My youngest was recently diagnosed with an allergy to milk and dairy. Probably the scariest moment in my life (well, the most recent one) was when I thought my daughter was going to die in my arms in a grocery store. She’s fine now. But, I’m in the process of going through a whole revolution in what I feed her–and now my older toddler, too. And, as I sat in a drive-through last week, waiting for a car-load of french fries and chicken, my heart kind of sunk. What was I doing? What am I really feeding my kid on the go?! I’m not going to lie. I thought about pulling out of that line and heading home to cook a “healthy” meal of hot dogs and cubed veggies (the only thing we had left in the pantry). But, I’d already ordered, everyone was super-hungry and I felt trapped. Literally–there was a car in front, a car behind and one of those curb-things between me and escape-ville. So, we got our food and gnoshed while I thought. What is it I feed my littlest when we’re out? 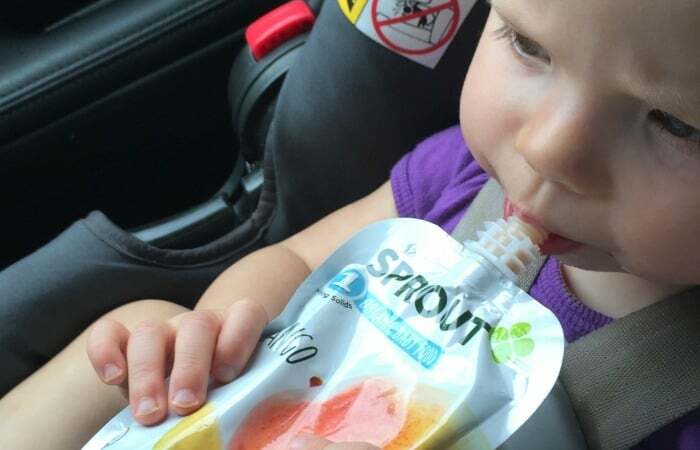 Sprout Organic Foods Pouches. I mean, she likes other food–especially fries on the rare occasion we get those, but she loves nothing more than Sprout pouches–that’s her very favorite. Yeah, those so-easy-to-hand a kid pouches. But–what the heck is even in them? 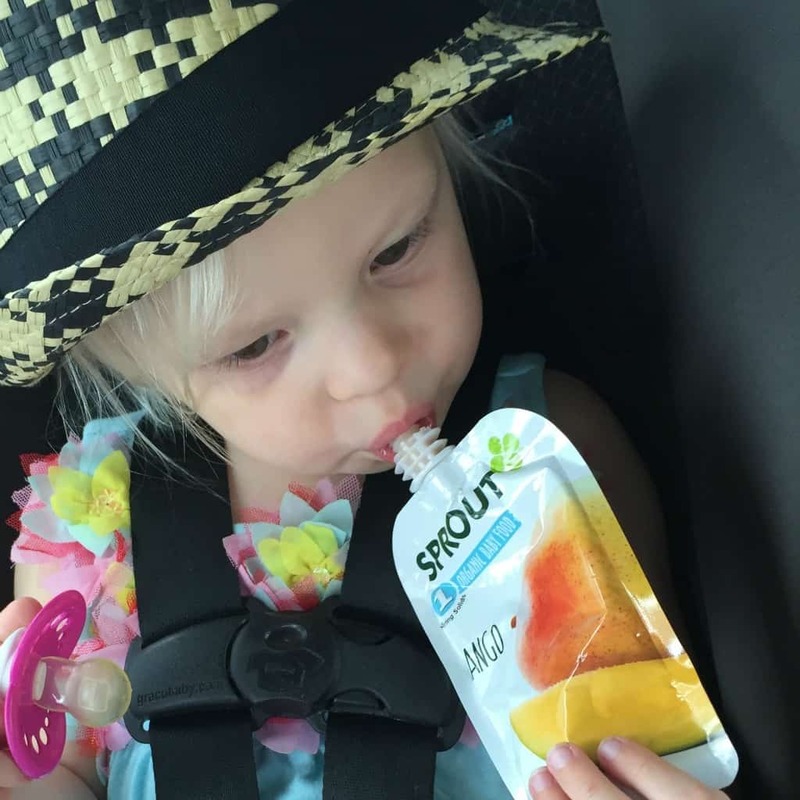 So, we finished our lunch and headed straight to Babies R Us–to do a little comparison shopping (and pick-up more pouches, because we were out) AND figure out this new, burning question: What am I really feeding my kid on the go?! The first thing I did was pick-up a Sprout pouch. I know that the Sprout Mission & Values are to offer delicious blends of whole fruits, vegetables, and grains–giving babies greater exposure to wholesome foods. But what does that mean? 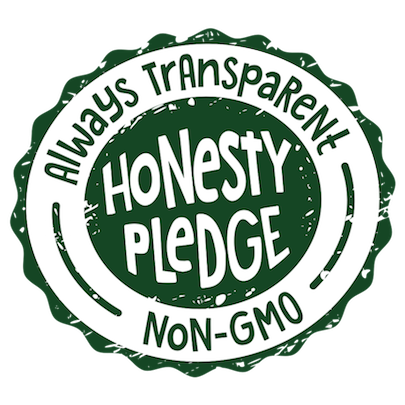 It means that what’s on the front of their pouches is what is in the ingredients list. Which makes me happy. Because that’s healthy stuff and research shows that the early development of a love of healthy foods helps to foster healthy eating habits for the rest of a person’s life. So, seeing all that yumminess? And that she’s got a love for it already? Perfection. Ok, so here’s what I am challenging you to do: Flip your pouches over. Look at the back. Ignore the pretty fronts for just a second. What’s in those pouches? Look at the first 6 ingredients. Are they good for your kid? 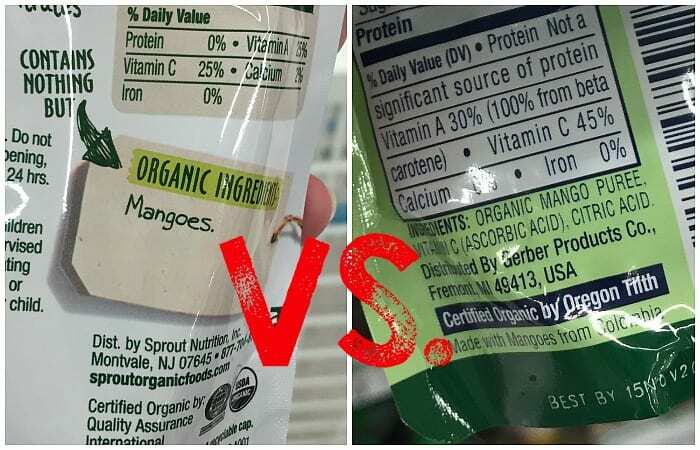 I didn’t like the comparison I did–why would a pouch of mango need preservatives? Why does it need anything more than mango? 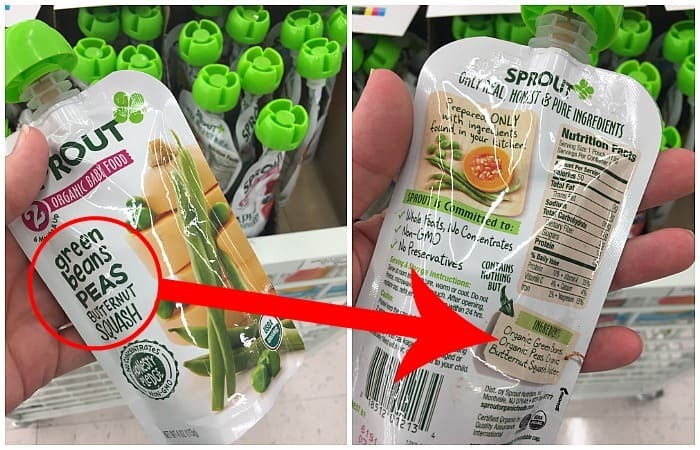 Frankly, I feel like what I’m seeing on the back of Sprouts is pretty good for my kid, considering that Sprout only uses those ingredients like the ones that you would use in your own kitchen, meaning there’s no preservatives and absolutely nothing artificial! And now, I feel confident answering the question: What am I really feeding my kid on the go?! Do you? Just take a few minutes and stop by your local Babies R Us on Sep 9th through Oct 2nd to get a $10 gift card with a $25 Sprout purchase. You’ll see the difference.